Support for Trump is destroying friendships, Freeman found. One pair of friends essentially broke up because one of the guys, who’s white, supports Trump, and the other, who’s black, finds that unconscionable. Trump is fracturing relationships between player and coach, too. 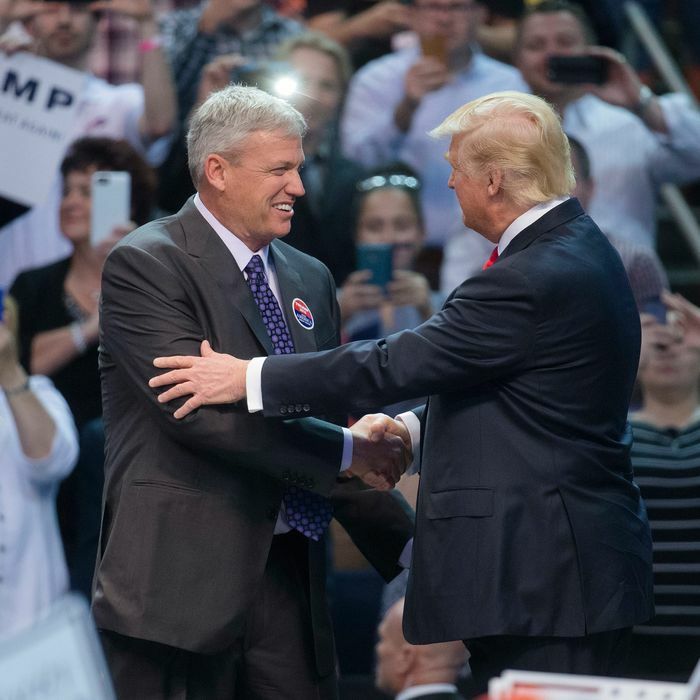 After Buffalo Bills head coach Rex Ryan appeared on the stage at a Trump rally last April, some of his players were shocked. “I see Trump as someone who is hostile to people of color, and the fact that Rex supports him made me look at him completely differently, and not in a positive way,” one anonymous player said. Freeman conducted a poll of the people he interviewed for the story and found support for Trump broken down along racial lines. 20 of 22 black NFL players plan to vote for Hillary Clinton. 2 of 22 black NFL players plan to vote for Donald J. Trump. 21 of 21 white NFL players plan to vote for Trump. Trump has become such a flashpoint for one team that its coach has banned discussion of him on team property. Another demonstration of just how controversial Trump is in NFL locker rooms is that only one player agreed to talk to Freeman on the record. It was Richie Incognito, the Bills guard who was once suspended for bullying a teammate. He supports Trump.